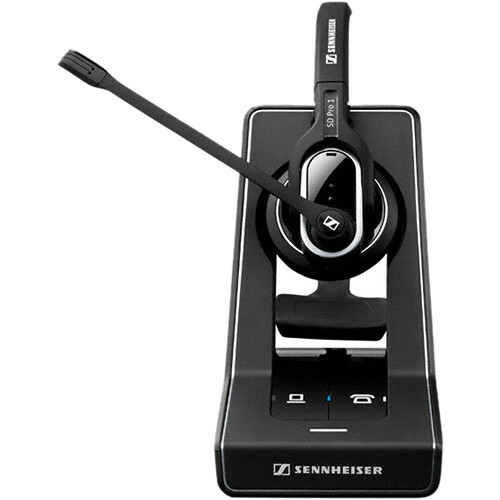 The SD Pro 1 Single Sided DECT 6.0 Wireless Headset from Sennheiser is a single-sided premium DECT wireless headset for desk phone and softphone. It features HD sound and voice clarity, a noise-cancelling microphone, and ActiveGard hearing protection technology. The headset is designed for business professionals who communicate via desk phone and softphone. It comes with side support and a large, soft leatherette ear pad for comfort and balance on the head. In wideband mode, the headset can provide up to 8 hours of talk time, and up to 12 hours of talk time in narrowband mode. It is designed to operate at a range of up to 180' in a typical office setting. SD Pro 1 Single Sided DECT 6.0 Wireless Headset is rated 5.0 out of 5 by 1. Rated 5 out of 5 by Anonymous from Awesome product Used in a call center environment. Easy to use, clear communnciations.